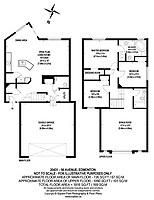 Square Feet draws floor plans according to industry standard guidelines. The plans also include a square footage calculation of the property. Square Feet also works in partnership with one of Alberta's leading Realtor branding and marketing companies. Our partner will drive your professional Realtor business with custom designed marketing collaterals, stationery, advertising, direct mail, postcards, listing presentations, feature sheets, newsletter banners, presentation folders, notepad and other marketing tools.